To Fernglen on the "Ships starting with F" page. 2 more pictures are available on this external page (click in them to make them larger). Delivered in Aug.-1936 from AB Götaverken, Gothenburg as Fernglen to A/S Glittre (Fearnley & Eger), Oslo. Steel hull, 425.6 x 56.8 x 21.9, 5206 gt, 9140 tdwt, 6cyl 2tev dm (Götaverken) 4200bhp. Used in the company's Fern Line, US Gulf - Far East. Captain: ? Paust (first name not known). He was briefly relieved in spring of 1944 by Karl Johan Løvik, who had previously been the captain of Granville. He had also served as captain of Roseville for a while, before joining Fernglen. Lillesand Sjømannsforening has Captain Løvik's story (external link) - text is in Norwegian, scroll down on the page for his WW II experiences and details on Fernglen's voyages. *Voyage taken from entries below, and departure date corrected. June 10 Hampton Roads   KS 509 Detached June 15. Sept. 24 New York City Gitmo Oct. 1 NG 308 For Trinidad. Dec. 31 Freetown   FTT 6 Detached Jan. 10-1943. Jan. 20 Hampton Roads(?) New York City Febr. 21* Independent *Should be Jan. 21. March 5 Trinidad   TB 7 Detached March 9. July 3 Trinidad   TJ 1 Detached July 14. Nov. 2 Trinidad   TJ 13 Detached indep. to Takoradi, Nov. 11. June 9 Trinidad Trinidad June 10 TJ 35 Returned, engine defects. June 19 Trinidad   TJ 36 Detached indep. to Takoradi, June 29. Her 1940 voyages are shown on Page 1, which also has some 1941 voyages, while Page 2 has the rest, as well as some 1942 voyages. See also Page 3. Convoy info for some of these can be found in the Voyage Record above. As mentioned further up on this page, Fernglen's Captain Paust was briefly relieved in the spring of 1944 by Karl Johan Løvik (May 11). Captain Løvik's story can be found in Norwegian at the external website that I've linked to at the beginning of this page. He says they loaded war stores and ammunition in New York for West Africa before departing as Commodore vessel in a convoy to Trinidad on May-21-1944 (see Page 4 and Voyage Record above). They were north of the Bahamas on June 6 when they heard about the allied invasion of Normandie. He says they arrived Trinidad for bunkers on June 20, then left that same afternoon in convoy, however, shortly after departure, Fernglen experienced engine problems and had to be towed back to Trinidad for repairs which took 10 days (it'll be noticed that the dates here don't match up with those given in the archive document mentioned above and in the Voyage Record). She then joined the next southbound convoy, going along the coast of South America, but was at some point ordered to leave the convoy to proceed independently to Sekondi-Takoradi, Ghana, where her cargo was unloaded, before continuing to Lagos and Agape, then on to Duala in Kamerun. Having discharged some cargo there, they headed north to Port Harcourt where palmoil was loaded, before going back to Lagos and Sekondi-Takoradi. By then it was August-1944. The captain says they had the British consul and his wife as passengers on their return voyage to New York, where he says they arrived Sept. 4 (Captain Løvik claims they were attacked by 2 torpedoes en route, which missed - this according to a "torpedo detector" they had had installed while in New York - and adds they had passed a lot of debris from torpedoed ships on this voyage). When Captain Paust returned on Sept. 14, Captain Løvik paid off, then joined Stirlingville the following month. As can be seen on Page 4, Fernglen remained in New York for over a month before proceeding to Dakar. Her 1945 voyages also start on this document and continue on Page 5 (to Apr.-1946). A 5cyl 2tev Fiat dm was installed in 1958. Sold in Jan.-1963 to Pan-Ocean Navigation Co. S.A., Panama (manager Pandelis John Angouras, Piræus) and renamed Billie (Greek flag). Damaged by Israeli artillery fire in Suez on June 25-1969. Laid up in Piræus June 29-1971. 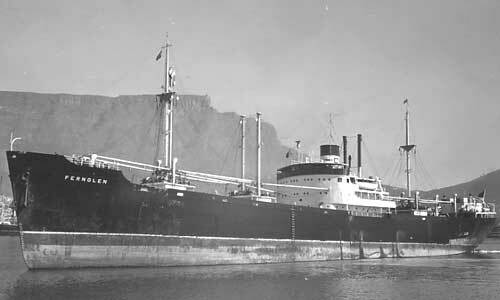 Sold in 1972 to unknown breakers in Gemlik, departing Piræus in tow on Aug. 31. Work commenced on Sept. 28-1972. Back to Fernglen on the "Ships starting with F" page. This company had another Fernglen prior to this one, delivered from Akers Mek. Verksted in 1929. It grounded on Aug. 13-1933 south of Cape Guardafui en route Makassas - Århus with copra. Salvaged, towed to Rotterdam and condemned. Sold "as-is" to Sven Salén, Stockholm and repaired as Sandhamn. Sold to French owners in Aug.-1939 and taken by German forces on Dec. 16-1942. Sunk during an allied air-attack on Suda Bay, Crete, 2098 died (she had Italian prisoners of war on board at the time). From Trygve's posting to my Ship Forum. The text on this page was compiled with the help of: Captain Løvik's story of his years at sea, E-mail from Roger W. Jordan, pre war and some post war details were received from T. Eriksen, Norway (his source: Article about Fearnley & Eger by Arne Ingar Tandberg in the Norwegian magazine "Skipet" 3.93 & 3.94) - and misc.